PALI DISTRICT in Rajasthan has over 800 textile industries that employ about 50 per cent of the city’s population. The region has been a textile hub since the 1970s, with an annual turnover of over Rs 7,000 crore. But the industries have severely polluted river Bandi on whose banks the city is located. The 40 km stretch of the river covered in a study by Delhi-based non-profit Centre for Science and Environment (CSE) in June this year bears testimony to the adverse impact the textile sector has had on the town. “The influx of untreated industrial effluents into Bandi has ruined most of the wells in the vicinity. Village residents have been forced to stop agricultural activities within two-three km of the river,” says Jaitpur-based activist Lakshman Dhulia. The problem is not new. India’s first common effluent treatment plant (CETP) was set up in Pali in 1982 to treat industrial effluents. But not much has changed. “The textile units have expanded over the past 30 years. The water of river Bandi and Nehra dam located downstream stinks due to the discharge of untreated effluents,” complains Nathuram Charan, a local farmer. “Of the 800 textile units in the town, 600 are under Central Pollution Control Board’s ‘red category’, denoting that they are highly polluting units,” says Anil Mehta, chairperson, Pali Water Pollution Control Research Foundation (PWPCRF), a local association of industrialists set up in 1994. The CSE study found that almost all textile units falling under the red category send effluents to the four CETPS of the city without any primary treatment. “As per the pollution control board norms, every industry that falls under the red category and has been given consent to operate needs to have a primary treatment plant,” says Pukhraj Patel, president, Sri Kisan Paryavaran Sangharsh Samiti, a Pali-based non-profit working on water pollution and related problems since 2004. In the study, 45 samples of surface and groundwater from different locations in Pali were tested. Almost 80 per cent of the surface water samples were found unfit for drinking. They were highly alkaline and had a high chemical oxygen demand (COD), indicating dangerous levels of organic pollutants. The levels of total dissolved solids (TDS) were four times higher than the standard (See ‘Contamination hubs’). Concentration of chlorides, which impact reproductive rates of freshwater organisms and reduce their lifespan, were nine times higher. On the other hand, the level of dissolved oxygen, necessary for aquatic life, was nearly zero. CSE also tested 21 samples of effluents of mills located in the industrial zones and found that approximately 80 per cent of these samples were highly polluted, with COD levels 11 times higher than standard limits. Effluent samples collected from three CETP outlets were also found to contain low concentrations of phenolic compounds which can cause skin irritation and breathing problems. CSE had previously investigated Pali in December 2007 and pointed that the major problem in the area was inefficient treatment plants. There are several other problems that ail the process of disposing of industrial waste in Pali. There is no system for the transport of effluents from the textile units to CETPs. Tankers carry them and spillage during transport contaminates the soil. CETPs, which are based on dated technology, are not working at full capacity, treating only 17 million litres of effluents a day against their maximum capacity of 34.68 million litres a day. The sludge rejected after the process, which has all the pollutants trapped, is dried and disposed of in nearby areas. “Many industries discharge effluents directly into the river, leading to severe pollution,” says Mhuveer Sukerlai, local activist and convener of Sri Kisan Paryavaran Sangharsh Samiti, a Pali-based non-profit working on water pollution related issues since 2004. The industries which do treat effluents follow sub-standard treatment parameters and are reluctant to upgrade their treatment technology. Also, most textile industries in Pali are small scale units and were involved in hand printing of cotton textiles prior to the 1990s. But today 40 per cent of mills in Pali are synthetic textile mills and the dyes used in synthetic fabrics are more difficult to treat because they are acidic in nature. The treatment system has not been able to keep pace with the change of effluent character. Moreover, infrastructure facilities of the state’s pollution control board are inadequate. “The regional laboratory is not in Pali. Samples go to Jodhpur and Jaipur for testing. To regulate the 700 dyeing units and other industries, there are only seven officials,” says R B Maurya, regional officer of Rajasthan Pollution Control Board. The industry is even defiant of court orders. Hearing a public interest litigation filed in 2004, the Jodhpur High Court in 2007 ordered closure of 126 dyeing units located outside industrial areas. The court had ordered that a new industrial area be developed and units operating outside industrial areas be shut or shifted. But nothing changed and the industries continue to operate. In 2012, Sri Kisan Paryavaran Sangharsh Samiti filed a case in the Jodhpur high court against textile unit operators, PWPCRF, Rajasthan Pollution Control Board, District Collector of Pali and the government of Rajasthan to suspend the functioning of all the textile units in Pali that were operating without “consent to operate” and to stop the discharge of untreated effluents into the Bandi river. On March 5 this year, the case was transferred to the National Green Tribunal which ordered closure of almost 600 textile units operating without the consent. The order is yet to be implemented because the industry has sought a review. Tiruppur district in Tamil Nadu is another textile hub which was highly polluted but has managed to check pollution. With 6,250 textile-related industries, this district is one of the biggest knitwear centres in the world. The sector employs 0.6 million and has an annual revenue of over Rs 13,000 crore. In the 1990s, the town had no treatment plants. The dyeing units would simply release untreated effluents into the Noyyalriver which made it highly polluted. The Orathupalayam dam downstream also had contaminated water. “All along the banks of the river there were piles of sludge which would stink. Our lands were spoilt and cattle got sick,” recalls A P Kandaswamy, president of Noyyal Ayacut Association, a local farmers’ union. But judicial intervention changed the scene. A two-decade-long legal battle, which started in 1996, ended with a large number of textile industries in Tiruppur adopting zero liquid discharge system (See ‘Neutralising effluents’). The zero liquid discharge system has three major processes. The first is pre-treatment process in which the alkaline effluent is neutralised. The second is filtration process during which the treated effluent is passed through a series of filters (reverse osmosis) and the filtered water is sent back to the companies while the rejects are sent to the third stage. The third process is evaporation in which the filtrates are evaporated to collect water vapour and salt. In 2011, the Madras High Court ordered closure of all 700 dyeing and bleaching units in the area and asked them to either pay monetary compensation to farmers for causing pollution or install zero liquid discharge (ZLD) system. Presently, of the 413 functioning units in Tiruppur, 70 have installed individual effluent treatment plants to meet zero liquid discharge norms. Residents and environmentalists working in Tiruppur say the pollution levels now are much lower than what they were 10-15 years back. “Earlier, the TDS levels of the river were 7,000-8,000 ppm (parts per million), now they are less than 1,100 ppm,” says A Eswaran, president of Tamil Nadu Science Forum, Tiruppur. 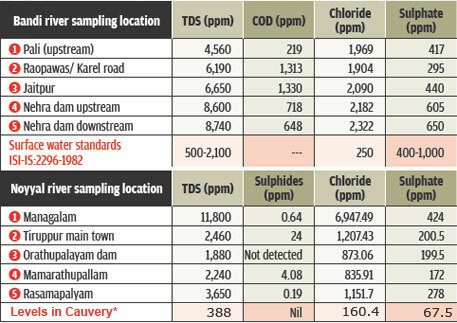 CSE tested 48 samples of surface water and groundwater from different locations in Tiruppur in May this year and found that TDS levels have decreased significantly upstream of the dam while in the downstream stretch the pollutant concentrations have not reduced. Compared to 2005, TDS concentrations along the upstream stretch were found to have decreased by three times, and sulphates and chlorides by two times in 2014. For pollutant levels in 2005, a study by the Madras School of Economics and Tamil Nadu Agriculture University was used. Though the situation has improved in Tiruppur, contamination levels remain high when compared to other rivers of the region. 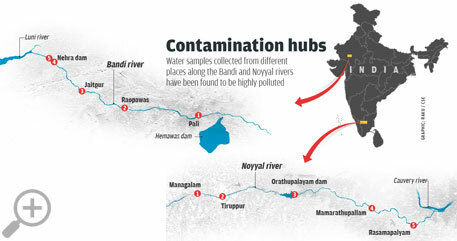 Noyyal is still highly polluted and Tiruppur is more polluted than its surroundings. Levels of COD, chlorides, sulphates, sulphides and TDS are high in areas, such as Managalam, Andipalayam, Tiruppur main town, Kasipalayam dam, Koolipalayam reservoir/ Nanjarayan pond and Chinamuthur, where dyeing units are concentrated. Formation of sulphide, which makes the soil infertile, has emerged as a new threat in these areas. More units need to opt for ZLD to cause a significant dent in pollution levels. Tamil Nadu Agricultural University, which is preparing a status report for the high court, has classified more than 20,000 ha in three districts around Tiruppur as severely affected. “Bringing this land back to normalcy is very difficult,” says vice chancellor K Ramaswamy. “Proper reclamation measures need to be taken,” he says. Despite these shortcomings,Tiruppur, unlike Pali, has taken concrete steps to fight the problem. Pali needs to leapfrog the conventional effluent treatment technology and move towards ZLD. “The conventional technology needs to change, we need a strong judicial intervention to clean the environment in Pali,” says Chandra Bhushan, deputy director general of CSE. In River Noyyal, MANGALAM TDS Correct 1064 ppm. Not 11,800. LA 11"06' 22.88 N. LO 077"16' 14.83 E.
Please correct the writen mistake. A.Eswaran,District President, Tamil Nadu Science Forum, Tiruppur District. There was a fault with the device when we did the field measurement. The TDS in Managalam was high. We have the sample still left in lab we can recheck. Bank loans to industrial units which cause extreme & dangerous pollution should be stopped. This should be practice all over India. An appropriate legal & administrative mechanim should be built for this purpose. This should be done as soon as there is prima facia evidence that the unit is causig extreme pollution. Court proceedings can follow later.Present central govt. wants to do away with the red tape environmental permissions cause. It should implement some such scheme. Your report on Tirupur's current situation is disappointing. Nearly four years after closure of all the dyeing & bleaching units and ETPs by the HC of Madras, there is hardly any improvement. Till date the polluting industry could not find a suitable technology to treat the effluents. Yet in the name of trial runs, commercial production is going on with the patronage of the state and obliging media. 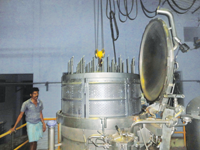 Many illegal units are mushrooming in the adjoining districts to do the dirty works of Tirupur dyers. You can see truck- loads of cloth are taken out from Tirupur to rivers Cauvery and Bhavani for washing. The washed cloth is brought back to Tirupur for drying. ETPs have systematized fraudulent means to cheat the public. Coloured effluents are discharged into the deep bore wells drilled by the dyers. These bore wells kept under cover in almost all the units and ETPs are testimonies for the dyers' intention. Only colourless - but poisonous - effluents are discharged into the nearby water sources and river Noyyal without attracting public fury. If an impartial investigation is made on the condition of air, soil and water around the so called successfully operating CETPs, the results will be shocking. 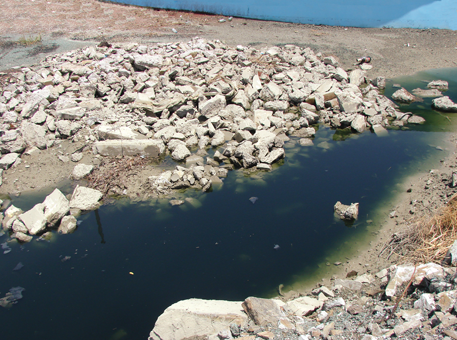 During the recent rains, units and ETPs were indiscriminately discharging untreated effluents into Noyyal. The situation had become so alarming that the officials asked the units to close down for a few days. You won't find any record of this horror. Last but not least, a damning report in The Hindu under the caption Ã”Ã‡Ã¿Effluents again mix with river waterÃ”Ã‡Ã– published on 22 Nov 2014 and a photograph attached with the report tell it all. Had your reporter interviewed proper people, the facts would have tumbled out. Tirupur is sitting on an ecological time bomb. Mr. A. Easwaran of Tamil Nadu Science Forum. Are you ready ready for an independent and impartial study on the happenings in Tirupur? Why this so called Science Forum and its polluting patrons are still groping in the darkness to evolve a methodology to treat the effluents? What are you going to do with the mountains of solid waste? Please stop fooling you and others. Hefty subsidies (State govt's 50% and Centre's 25%) are given to the polluters for establishing treatment plants negating the Polluter Pays Principle. If these illegal subsidies are stopped, the polluting industries will die a natural death. Sooner the state put a full stop to this illegal assistance the better for the people. Banks in EU refused to finance Adani's coal mining project in Australia on ecological grounds. But SBI chases Adani with loans. Ecology is nothing for our govt and bankers. The article says situations has not improved in Tirupur. It only says some efforts have been taken to curb pollution in the area which has not happened in other parts of the country like Pali. SURFACE WATER contaminant levels have reduced compared to 2005. Our study area was a very limited section of Tirupur, Karur and Coimbatore. Groundwater sample analysis was not done during the May 2014 study of ours as it was not included in the scope. Our study concentrates mostly on the surface water quality. TNAU has collected 50,000 water samples (includes ground and surface water)and many soil samples, etc from three districts and is documenting the status to the court, and that can better reflect the status of the area. I m awaiting their report.